My honey was nice enough to help get this beauty hanging above the mantle this past weekend; it was a rainy, sloppy couple of days. Unfortunately, it was much too wet for any kind of weeding or trimming out in the garden, but the perfect weekend to ask for a wee little favor inside the house. Grin! So I got out a “monkey hook”, which works great on old plaster walls by the way. He popped that baby in and the mirror was up in two blinks. Hmm… is it too low? Yes, it looks weird and it didn’t quite cover up the old holes we haven’t gotten around to patching. Time to get to business so he whipped out the big guns, his drill. So now he’s standing on our rickety old step stool with a heavier than it looks mirror above his head. Here? Too low? After way too many highers and lowers and one too many tries… a bit of shabby cottage style now resides above our mantle. What to you think? Too high? 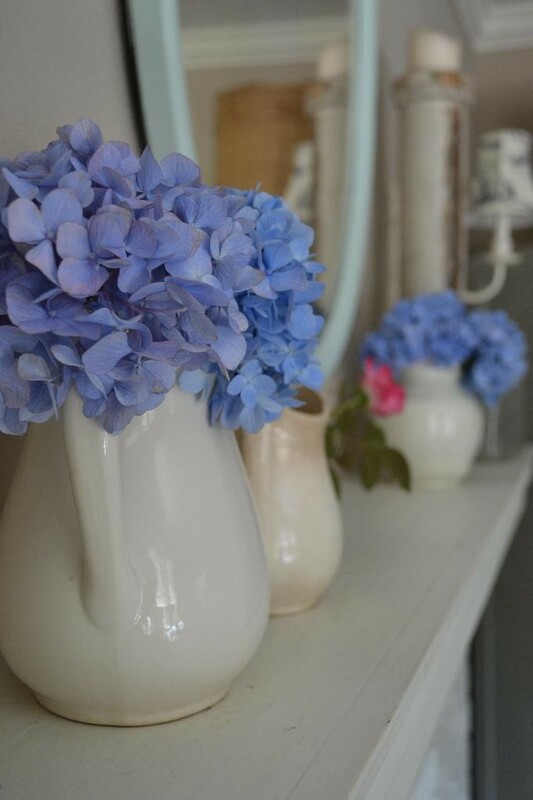 And lets not forget to have a little chat about the lovely blue hydrangeas — ahh those lovely blue hydrangeas. If your wondering if there are any more waiting to be picked out in the garden, um no not a single blue bloom. What could I do? 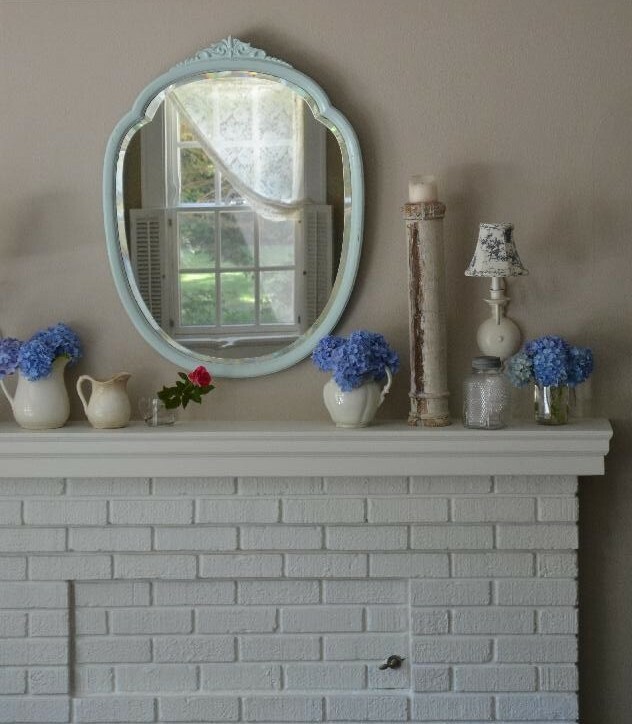 The mantel has been feeling neglected after all and in need of some fresh Summer style. Your mirror looks just lovely. It looks almost exactly like a mirror I have over my mantel right now that was one of my Grandmother’s wedding presents. I haven’t painted mine, but did refinish the wood when it was given to me over 30 years ago. It has the same beveled glass too. I think a nice mirror always looks great over a mantel. The mirror is perfect in every way!! Sometimes those rainy days come in very handy. 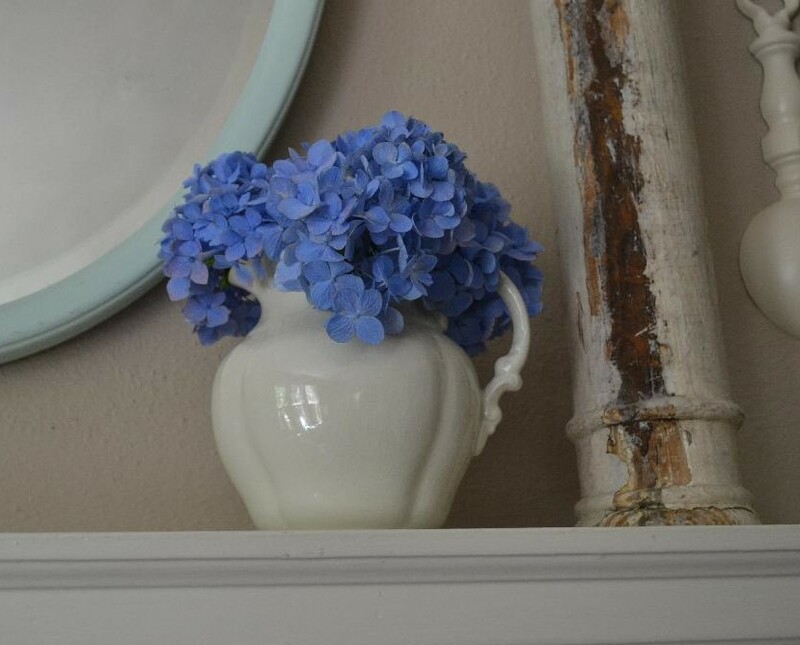 🙂 I’m having hydrangea envy…yours are beautiful in the white ironstone pitchers! I have 6 blooms on all of my 4 hydrangea bushes combined…yes, only 6. 🙁 And those babies are coming inside once they’re fully open where I can enjoy seeing them all day long!! Love it! I pick all of ours too! We have four plants and only one of them is blooming. I’m still hoping the others will bloom too. I love your fireplace! 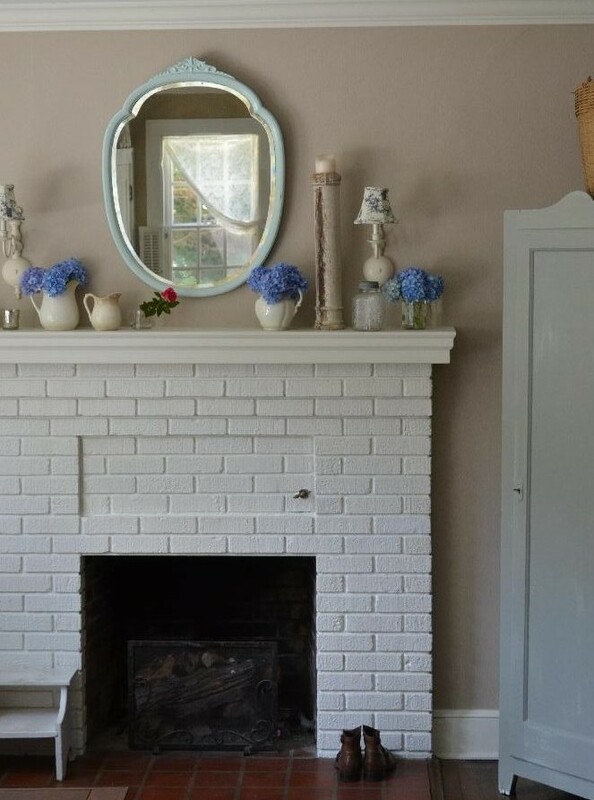 We just recently painted our old ugly red brick fireplace white! The pop of blue is perfect! 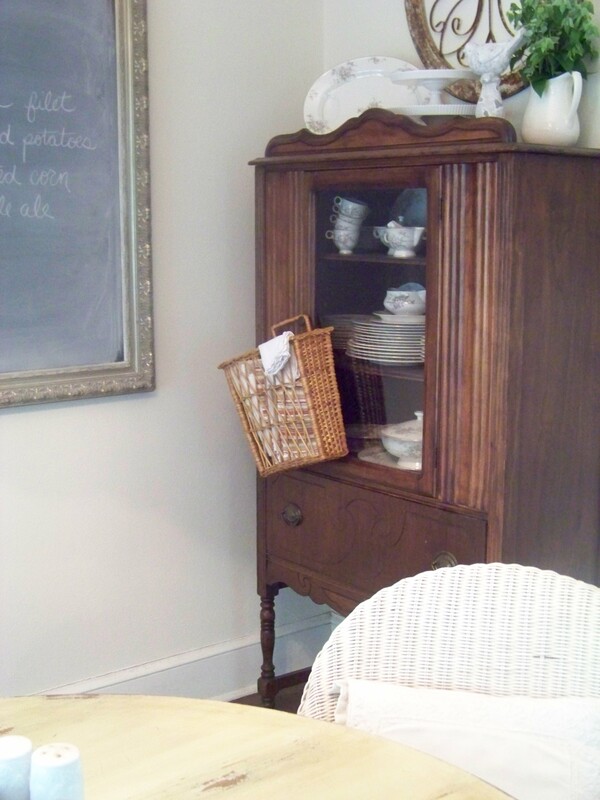 And your ironstone …. Love. 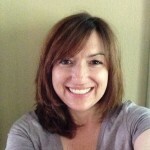 Wonderful blog, looking forward to getting caught up on past posts.